A Palm Beach Gardens man clings to life at an area hospital after a high-speed pedestrian-vehicle collision. Florida Highway Patrol officials state that the incident occurred near mile marker 94, which is immediately north of the Palm Beach County border. A 36-year-old man, who was driving a Nissan Maxima, rear-ended a man driving a Dodge Ram pickup truck shortly after 6 a.m. The Maxima driver ended up on the right shoulder, and the pickup came to rest on the center median. For unknown reasons, the Maxima driver exited his vehicle and tried to cross traffic, when he was hit by a 34-year-old man operating a Honda CRV. The victim was airlifted to an area hospital in critical condition. Investigators have ruled out impairment but are still trying to determine a cause. 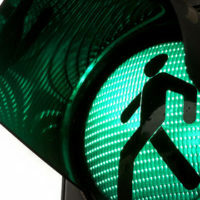 Primarily due to the laws of physics, high-speed pedestrian-vehicle collisions are among the most serious kinds of vehicle wrecks, in terms of pedestrian injuries. Indeed, the pedestrian fatality rate is 90 percent if the vehicle is travelling at least 58mph. Speed multiplies the force in any collision between two objects, which is why the fatality rate is significantly lower (75 percent) at 50mph. Compensation in these cases includes money for both tangible damages, such as medical bills, and intangible damages, including pain and suffering. Based on the evidence, it appears that the Maxima driver may have sustained a whiplash-related concussion in the initial vehicle collision. Low-grade concussions often leave victims in mental fogs, so while they do not lose consciousness, they cannot think clearly. Such injuries explain otherwise bizarre behavior, such as a person who tries to walk across a freeway during rush hour. Whiplash has other effects as well, such as severe neck pain, significantly decreased range of motion, and chronic severe headaches that radiate from the base of the skull to the forehead. The sudden, jarring motion in vehicle collisions usually causes whiplash, so restraint systems, such as seat belts and airbags, usually do little or nothing to prevent these injuries. Whiplash does not show up on X-rays and other common tests, making this condition difficult to diagnose. An attorney can connect car crash victims with medical professionals who regularly handle these types of cases, so victims can get the accurate diagnosis and suitable treatment they need to fully recover from their injuries. Known Risk: This prong is usually easy to establish, because almost everyone knows that it is dangerous to cross a highway on foot. Voluntary Assumption: This element is harder to establish in head injury cases, because concussed victims are normally unable to knowingly do anything. Many times, rather than cancelling damages altogether, the judge will reduce the victim’s recovery based on his/her percentage of fault. Florida is a pure comparative negligence state, so at least theoretically, a victim could be 99 percent responsible for his/her injuries and still recover a proportional share of damages. Because they are completely unprotected from oncoming cars, pedestrians are usually seriously injured in these collisions. For a free consultation with an experienced personal injury lawyer in Port St. Lucie, contact Eighmie Law Firm, P.A. We do not charge upfront legal fees in negligence cases.